It's no secret that there is poverty in Mexico. The government itself measures it and analyzes it and publicizes it. The agency responsible is CONEVAL, the National Council of Evauation of Social Development Policies at www.coneval.gob.mx. The measurement of poverty: methods, terms and results are laid out in excellent graphics here. Today La Jornada presented a good summary of the results for 2012. 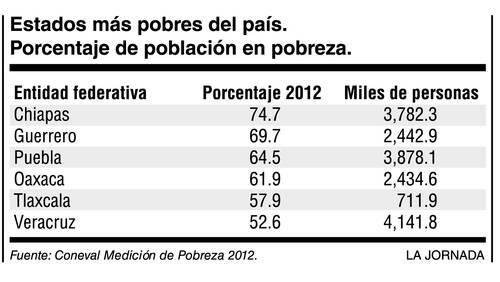 Below,from La Jornada, is a cart showing the states with the largest percentage of poor people. The government measures at least five markers: income; nutrition; health; social security (meaning pensions and payments of various sorts to workers -- I am not clear about this) and the government's health care system; educational levels, and housing situation. The current statistics show a slight reduction from 46.1% in 2010 to 45.5% in 2012,or 53.3 million people. People living in extreme porverty number 11.5 million or 9.8 percent. In te whole population, there are only 23.2 million people who are not vulnerable to falling into poverty. Our neighbors, as examples of vulnerability realized, were laid off (without any benefits) by Coca Cola. One man finally got a job driving for a security company, the other after considerably longer, got a stock job at the new Bodega Aurrera in Coatepec. The extended family came together, but it was hard for everyone although they got income from a miscellany of sources: picking coffee, two small tiendas, temporary work as cleaning people and in neighborhood construction. The government defines poverty as lacks in two of the markers; extreme poverty as lacks in 3 or more of the markers.Income for rural areas has to be at least 1490 pesos a month or 116.38 dollars a month. In cities, the minimum income is 2329 pesos or 182.69 dollars at today's rate of exchange. Where we live counts as rural. We are the sole regular income for our gardener. From us he gets between 960 pesos and 1440 pesos a month. A friend gives him a grant of 150 pesos a month to help cover his son's medicine which Seguro Popular does not cover, though it treats his son. He and his older boys pick coffee and they have some old-fashioned video games at the house that neighborhood kids pay to use. Some things have improved, notably health care, with the expansion of Seguro Popular, or health insurance for everyone. This does meet basic needs, but often people don't have enough money to pay for medicines. Schooling, via television, is available to all the kids in our Colonia. Most go through secondaria which ends at the equivalent of ninth grade. Those who drop out often do so to go to work for their families. We also have a Telebachillerato, the equivalent of high school. Kids who show some interest and aptitude for academic work continue in this. The woman who cleans for us has three daughters, two of whom are now in University. One is studying pedagogy, the other, business administration. This is quite a burden for the family although the husband is a well-respected house builder and construction worker and makes a good income when he has jobs. The woman makes 1360 in a four-week month with us, occasionally more when we need more. By itself, the round trip bus trip to the University for each girl is about 720 pesos a month. There are no bus passes. Most living places in our colonia are adequate. Some people have benefitted from new houses built by the government (basic cinderblock construction), by a program to replace dirt floors with concrete, and from a program to replace interior wood-burning stoves with efficient wood-burning stoves with chimneys. Generally, it is agreed that there has to be economic reform which enables people to make a living wage without moving to factories (which can only hire so many people anyway) in distant locations. NAFTA did away especially with much local farming and animal production. Nutrition is an interesting issue. Mexico has been overrun with junk food which is sometimes cheaper than the good stuff people used to eat. Soda is often cheaper than bottled water. As a result, though health care is more accessible, rates of obesity and diabetes are increasing. The Times of the GXCM: Restaurants, Bars, etc. Zapateria Yessy in Teocelo--Such Deals on Shoes! More rocks, stones, tear gas. We need, rather, more understanding. Yucatan Living - Welcome to Merida & Yucatan, Mexico! For all of you with curiosity about Mexico this is a great blog by a guy married to a Mexican in Irapuato. Really, this kind of stuff is what people up north should be reading.